Clam Chowder doesn’t have to be runny or full of cream. Add more of the good stuff to make this Chunky New England Clam Chowder. Soup and I have an interesting relationship. My husband LOVES soup – all forms of soups. And he passed this soup obsession to two out of three kids. Me? I like to chew my food. Soup doesn’t light my fire like it does for my husband. I lean towards chunkier soups than the traditional liquid type. The same for peanut butter and mashed potatoes – I like them chunky. One soup I do go ga-ga over is chowder. I love red AND white clam chowder. But even my beloved white chowder needed a little makeover for me. So, I went chunky. 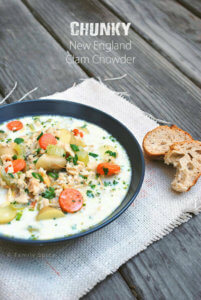 And if you love Manhattan Clam Chowder, I got a recipe for you here! 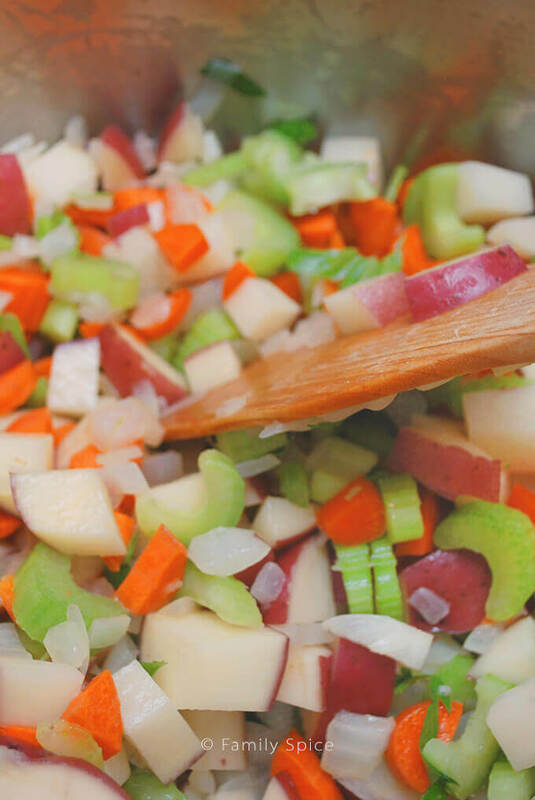 The basic vegetables for a fabulous clam chowder is pretty universal: onions, potatoes, carrots and celery. I like to change things up, of course, and have used a variety of potatoes for clam chowder: red potatoes, finger potatoes, russet potatoes. For thin skinned potatoes, I like to keep the skin on. But for thick skinned tots, like the Russet, I peel the potatoes. Some may feel that it is a sin to not start with bacon when you are making clam chowder. Don’t get me wrong, I love, love, LOVE bacon. But I don’t really care for it in my chowder. I do like to sprinkle a little crushed up bacon on top, as a garnish. I live in Southern California. 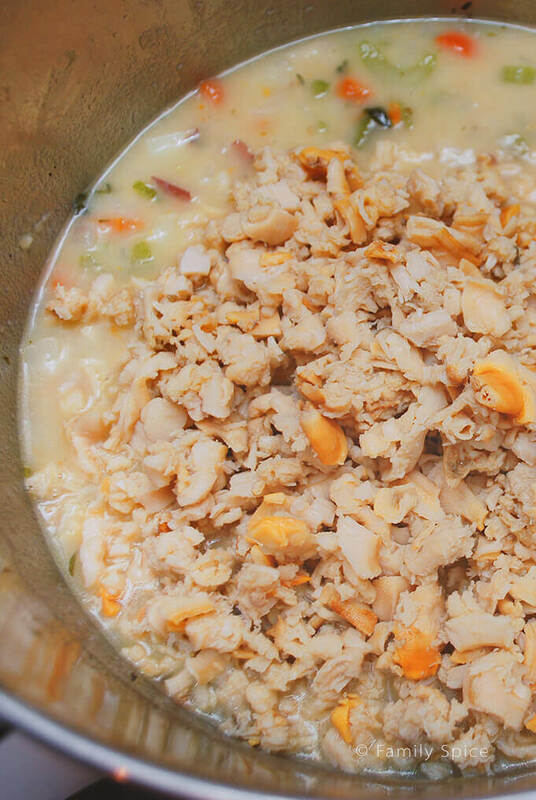 Getting fresh clams can be difficult, let alone expensive considering you need about 3-pounds of clam meat for this chunk clam chowder. So, I always use canned clams. And just a note, Costco sells big gonga cans of clam chowder for a great price! Just remember when using canned clams, drain the clams (save the juice for your chowder!) 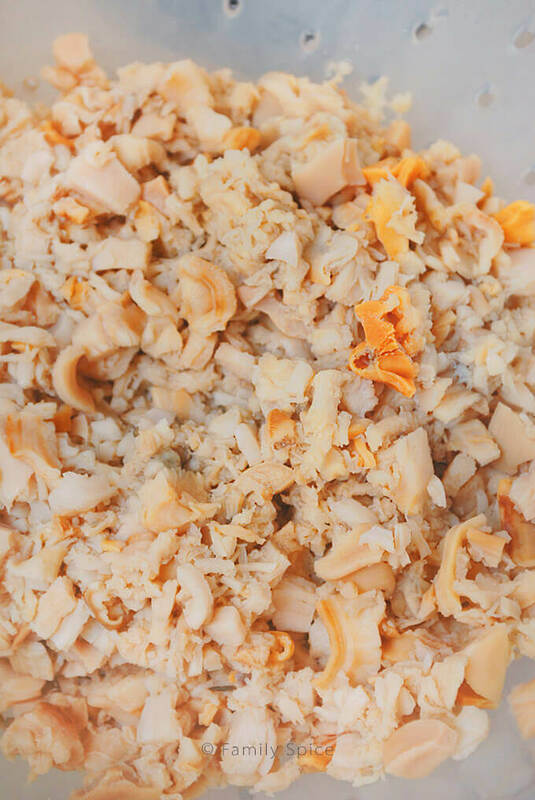 and give the clams a good shake and rinse with water so you can get the grit out. 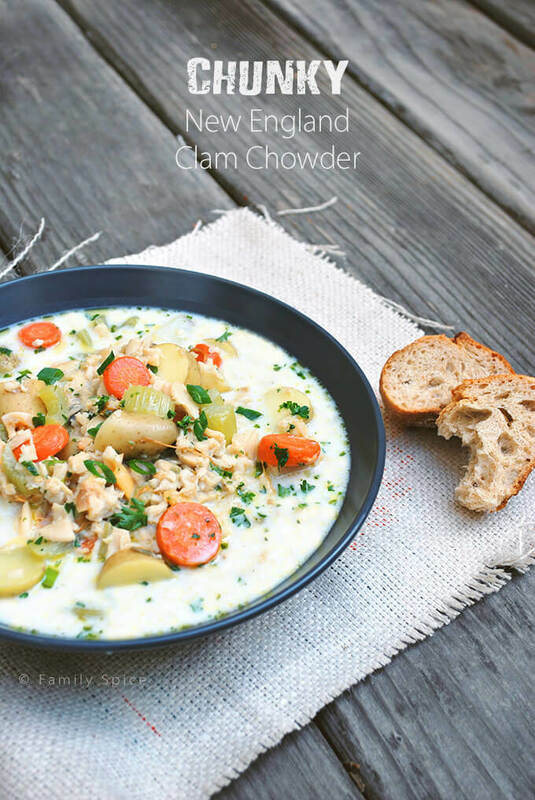 This Chunky New England Clam Chowder epitomizes what I love: chunks of clams to chew on, chunks of potatoes I can taste, chunks of celery and carrots that are full of flavor all hugged in a creamy base. Now this is a soup I can clearly bite into. Cook until softened, about 8 minutes. Continue to cook vegetable for 5 mins, stirring often. Cook for an additional 2 mins. Stir the clam juice to the cooked vegetables, scraping the bottom of the pot to pick up the browned bits. Bring the soup to a boil, then reduce to low and simmer until the vegetables are tender, about 15 mins. Wife, I’m proud of you for sticking with this and certainly pray for your success. The site looks great and must say, your food is awesome. Karen and Andrew, you guys rock. As someone who works in the IT world, I am truly impressed with what you’ve done. What a monumental task you undertook and such beautiful results. The site is gorgeous; the database appears to work flawlessly. You guys did awesome work. Well done! Thank you so much! It’s been 3 years of hard work and I couldn’t have done it without the help of good friends. I’m relieved we’re “done” – ha! ha! ABSOLUTELY! We missed Chinese New Year, but Persian New year is coming up! This really awesome. I love the new look and feel of the site. All the long hours have paid off. We sure hope to see you out and about more! I know, dinner party! Yeah, Baby. Thanks, Lois! Yeah, baby! I so NEED to get out of my house. Oh yeah, when taxes are done – ha! ha! Thank you, Nami! You always have something sweet & kind to say to keep me going! I found your site by sheer good fortune – liked both Family Spice and Frieda’s Produce on Face Book and hope my entries took. Your site looks very professional and I shall be spending much time browsing. Thanks for an interesting place to visit. 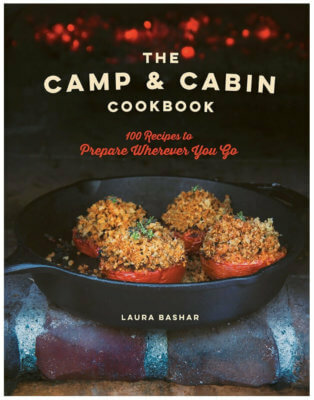 I’m glad you like my site and I hope you enjoy my recipes! Consider yourself entered in the contest!